With nuclear holocaust threatening to spill out of North Korea into Asia, or even America, I can’t resist dusting off this previously unpublished photo from April 9, 2017. Vitals: f/2, ISO 200, 1/70 sec, 23mm; 5:22 p.m. PDT. 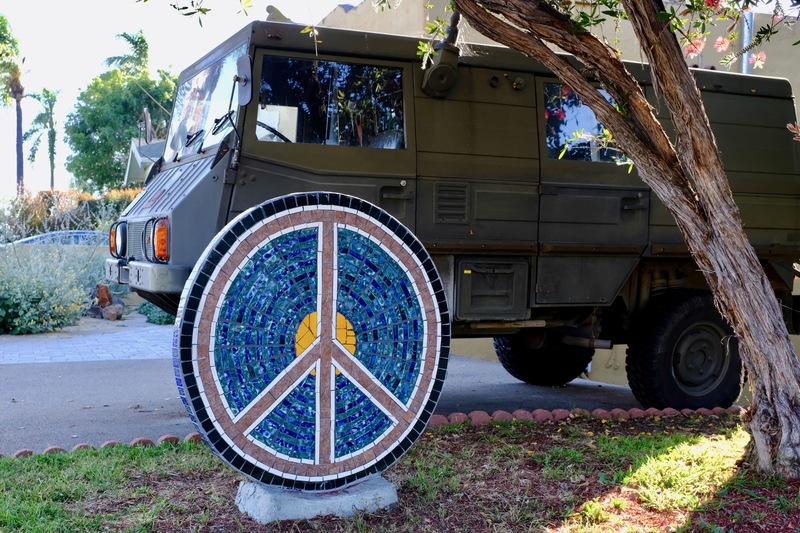 The military vehicle set behind the peace sign seems all the more relevant. I captured the Featured Image using Fujifilm X100F but had discarded the pic for how severely highlights are blown out among the palm trees. Somehow, with book/film On the Beach as one bright future scenario ahead, ridiculous little details don’t seem to matter as much. If the truck looks familiar, it is—shared with you on Halloween Day 2016. Let us hope that portrait, with skeletons sitting in the cab between a headstone, doesn’t foreshadow the grim reaper coming for us all. If he does, remember to look away from the nuclear blast. Protect your eyes! You will need them to navigate through rubble and peel back skin dying from radiation rot.